If you only have 3 days in Los Angeles and are wondering where to start, you’ve come to the right place. As a local, I can give you some good advice and tips for visiting the city. 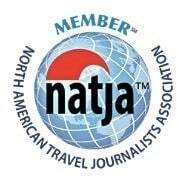 I can also help you plan the perfect Los Angeles itinerary that will leave you with lots of great memories. 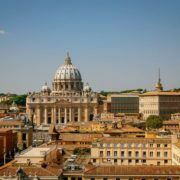 The city has many attractions, but they are not concentrated in one single area like in other cities around the world. Los Angeles’s points of interest are spread quite far apart from each other, so don’t assume that you can figure out an itinerary as you go. Chances of stumbling upon a great site accidentally are quite slim. The suggested itinerary below was designed for those who have 3 days in Los Angeles, but is also good if you have one, or two or even more than three days here. There are some facts about Los Angeles that you probably already know. 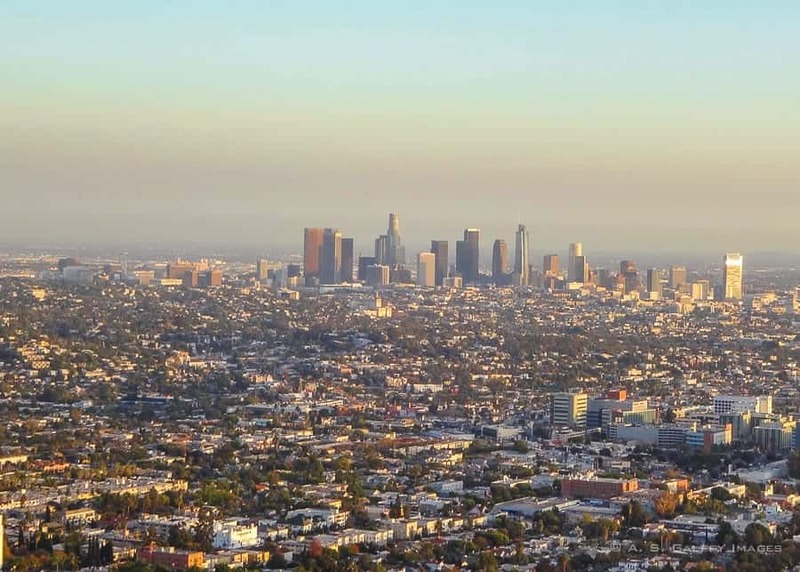 But the first thing you should be aware of before coming here is that Los Angeles is massive! This fact pervades nearly all the advice that follows and will definitely influence your Los Angeles itinerary. For first time visitors it can be hard to imagine just how spread out L.A. is. 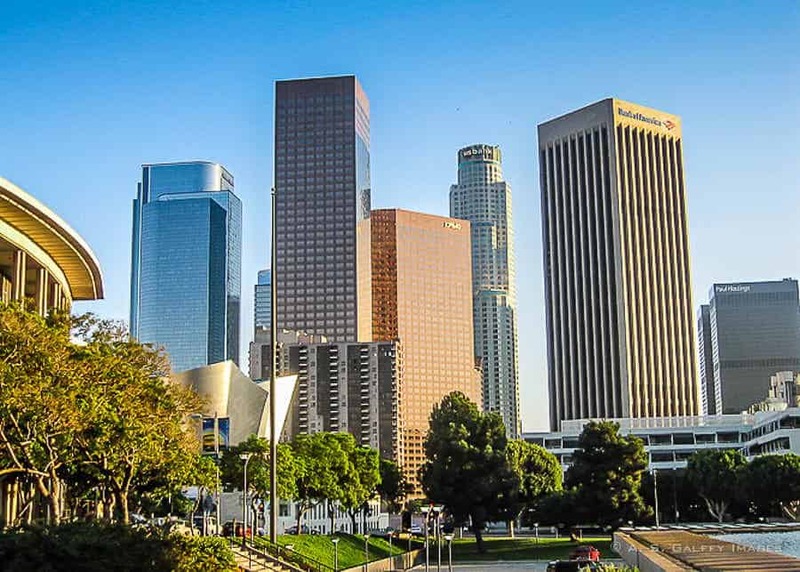 Los Angeles is about half the size of Rhode Island and includes many other smaller cities, like Santa Monica, Beverly Hills, or West Hollywood, which we colloquially call “L.A.” The city is also very eclectic and is made up of hundreds of neighborhoods that look and feel quite different from each other. While Downtown L.A. is modern and contemporary, neighborhoods like Altadena, or North Hollywood, are way calmer and laid back. The places of interest in L.A. are as spread out as this sprawling metropolis is. So in order to accomplish your Los Angeles itinerary you’ll have to either rent a car, or use public transportation. The best way to explore the city is definitely by car, but driving in L.A. may be quite challenging. If you don’t want to face the city’s infernal traffic and tricky parking signs, you will be better off using public transportation. Plenty of Los Angeles neighborhoods are not only walkable, but connected to one another by train. The L.A. Metro system works good and has many stops. To use the Metro, purchase a TAP card at any Metro station from one of the vending machines. 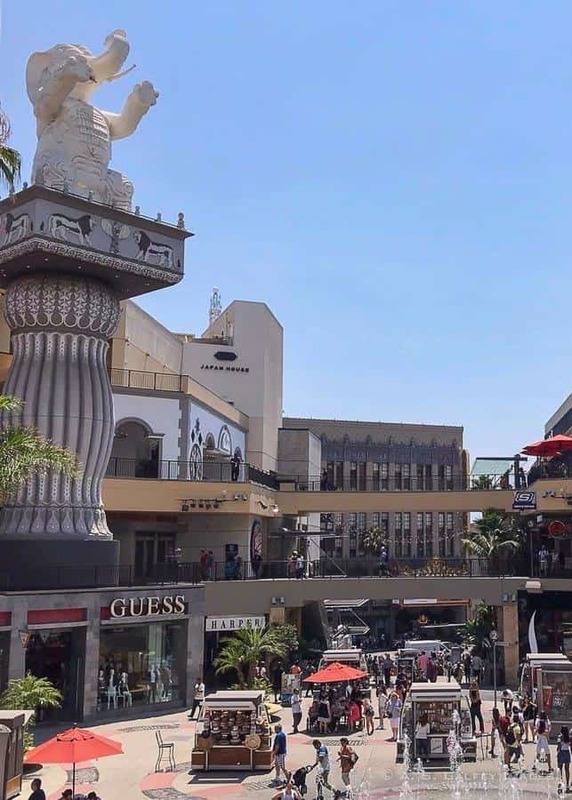 The Red Line, which begins at the Union Station in downtown L.A, will take you to Los Feliz, Hollywood, and to Universal City (home of Universal Studios). The Purple Line will take you through Koreatown, and the Gold Line goes through neighborhoods like Chinatown, Highland Park, and Little Tokyo. The Expo Line goes all the way to Santa Monica, just a short walk from the famous Santa Monica Pier and the beach. It’s hard to know where to start when you visit a city like LA. There’s so much to see here! So many things to do and experience! If you are coming from a smaller place, Los Angeles will feel overwhelming. It is however a very exciting place! 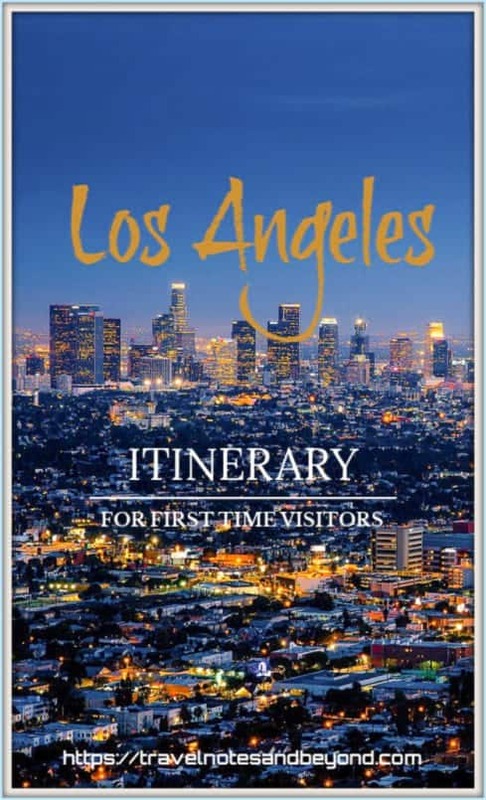 The Los Angeles itinerary suggested below will take you to some of the city’s most iconic places. You shouldn’t worry about squeezing in more into these three days. As someone who has been living here for 30 years, I can assure you it’s simply not possible. Some of the places that I included in this itinerary are totally free, which is always a plus. The 72 miles of coastline and approximately 330 days of sunshine are a magnet for the visitors of L.A. Besides, the coastal areas are among the most scenic places in Southern California. 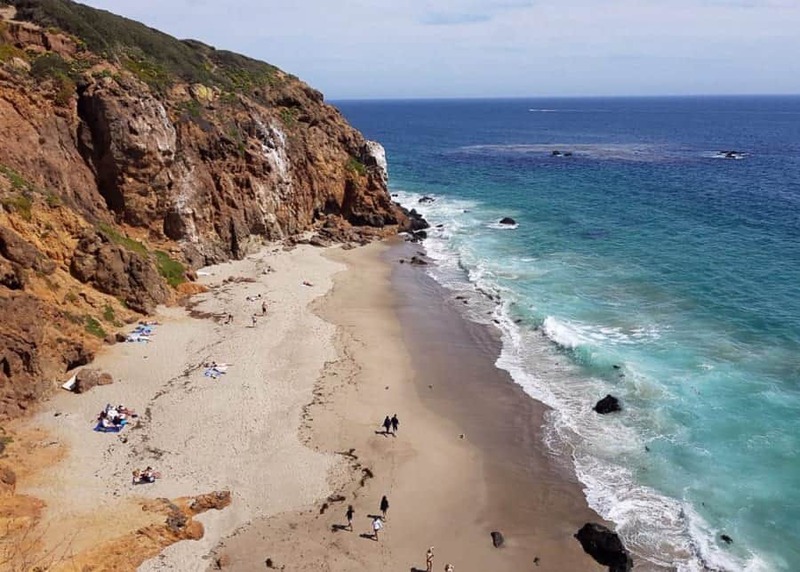 In all, there are over 60 beaches on this incredible stretch of coastline, so it’s best if you start your Los Angeles itinerary at the beach. The closest and most popular ones to downtown L.A. are Santa Monica, Venice and Malibu. You can start your first day in L.A. at the Santa Monica Beach, just a short 20-minute drive from the downtown. Santa Monica Beach stretches along either side of the historic Santa Monica Pier and has plenty of parking, restrooms and several beach side cafés. 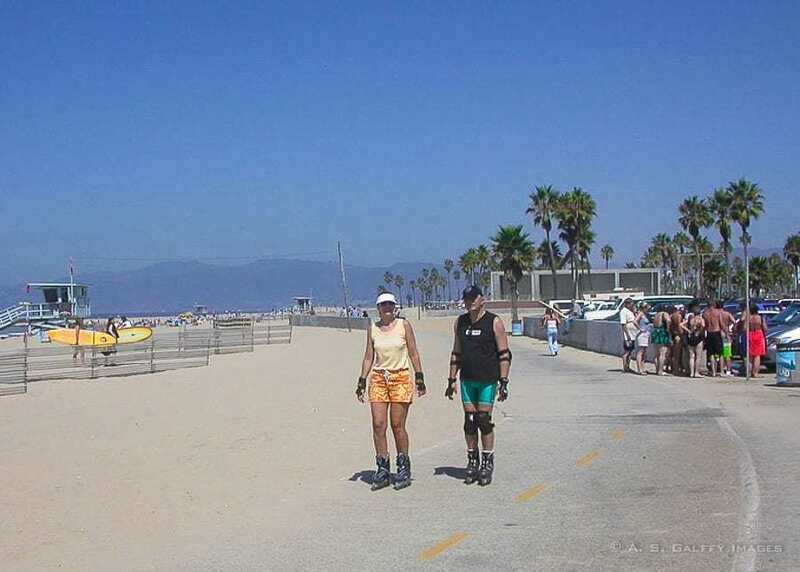 The paved path that follows the shoreline all the way to Venice Beach is a paradise for rollerblading, biking, or walking. There are many small shops where you can rent bikes, rollerblades, boogie boards, chairs, and umbrellas. If you don’t want to lay down on the beach, grab your skateboard or bicycle and cruise from Santa Monica Pier to Venice and back. The most popular spot in Santa Monica is the Pier at the foot of Colorado Avenue. This bustling wooden wharf is where the action is. 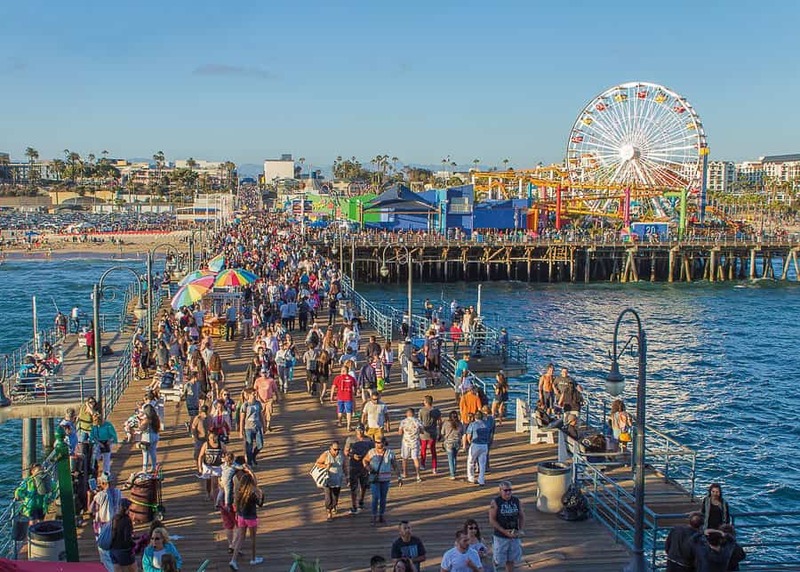 With its shops, small restaurants, arcade, roller coaster and giant Ferris wheel, the historic Santa Monica Pier continues to be the main attraction in Santa Monica. 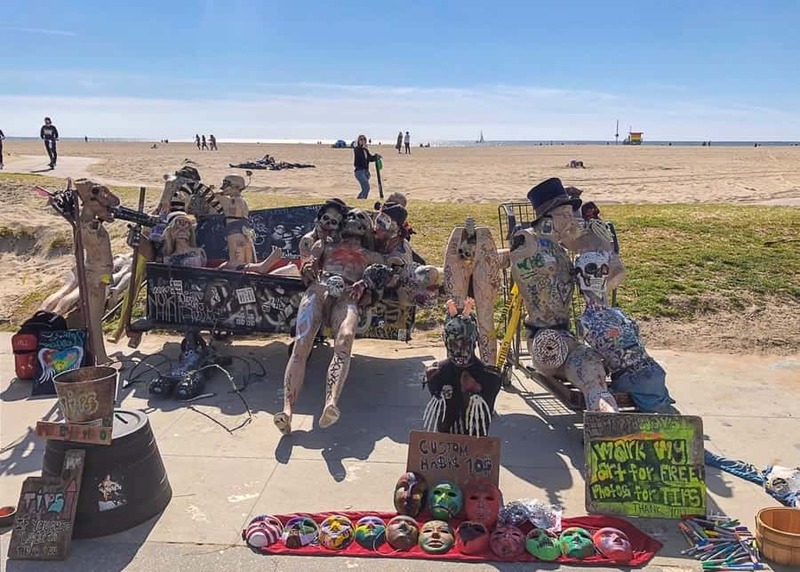 Just South of Santa Monica is one of Los Angeles’s most popular and eclectic places: Venice Beach. However, this beach is a mixed bag that isn’t for everyone. If you want to experience the bohemian spirit of Los Angeles, you should definitely come here. Be advised however that the free-spirited Venice Broadwalk may shock you with its colorful graffiti, street performers, and funky shops. You will see some things that you’ve never seen before and will shake your head. But you may very well find all these very entertaining. I love Venice Beach, always have. It has an indescribable vibe that I have only experienced here. When we were younger we used to rollerblade from here all the way to Santa Monica and back. If you enjoy people watching, then this is the place to be. It is for sure one of the most unique beach-going experiences you’ll have. Malibu has some of the the most picturesque stretches of beach in Southern California. They are however very different from the beaches of Santa Monica or Venice. Some of them are private, so they allow alcohol on the beach (Paradise Cove), but they are notorious for the huge parking fees. 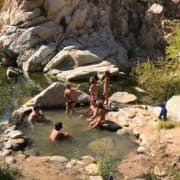 In Malibu you will find surf beaches and stretches of shore with tide pools, caves and strange rock formations (Leo Carillo). If you want to explore the caves and rock formations, you should come prepared with good shoes because you’ll have to walk down a big bluff. Malibu beaches offer a truly laidback experience where you can just lay in the sand and dip in the ocean. And if you are in Los Angeles when the whales migrate (Dec.-Jan, April-May) you’re likely to see some gray whales, dolphins and seals here. Especially if you visit Malibu early morning. The Getty Center is a very impressive place to visit, even if you’re not a huge art or museum devotee. This is not just one of my favorite art museums in the world, but one of Southern California’s most popular attractions. The Getty Center (not at the same location as the Getty Villa) sits high up on a hill overlooking the city and is connected to the parking lot at the bottom by a funicular. The museum has numerous galleries that spread out in multiple buildings. The Center holds the best and most valuable art collection in Los Angeles. 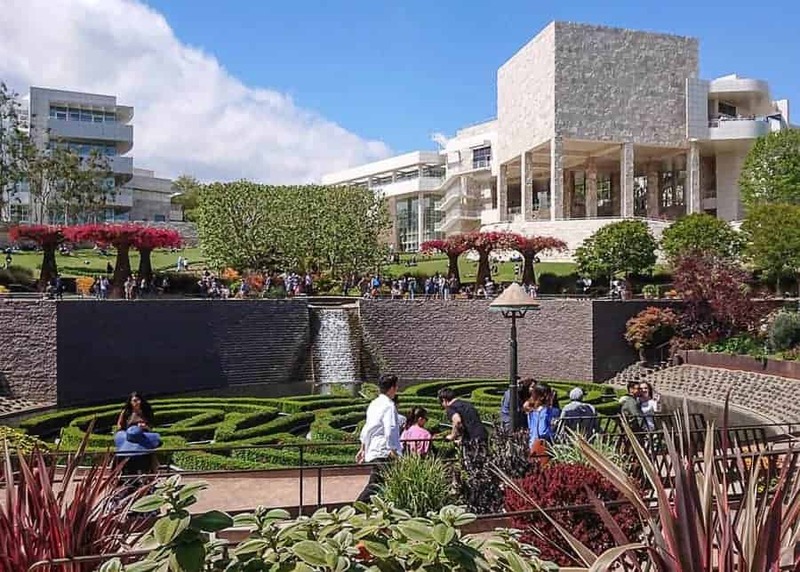 In addition to its extensive artwork collection and unique architecture, the Getty Center features an impressive garden. The Central Garden, designed by artist Robert Irwin, sprawls over 134,000 square feet of green space. The garden contains 500 species of plants from around the world and is a beautiful place to walk around and relax. You can easily spend an entire day here, admiring the outstanding art collections. There are several options for lunch at the Getty Center. You can either bring your own food and set up at the picnic tables at the lower tram plaza. Or, ff you just need a quick bite between exhibits, you can grab a bite from one of the coffee carts in the museum courtyard. 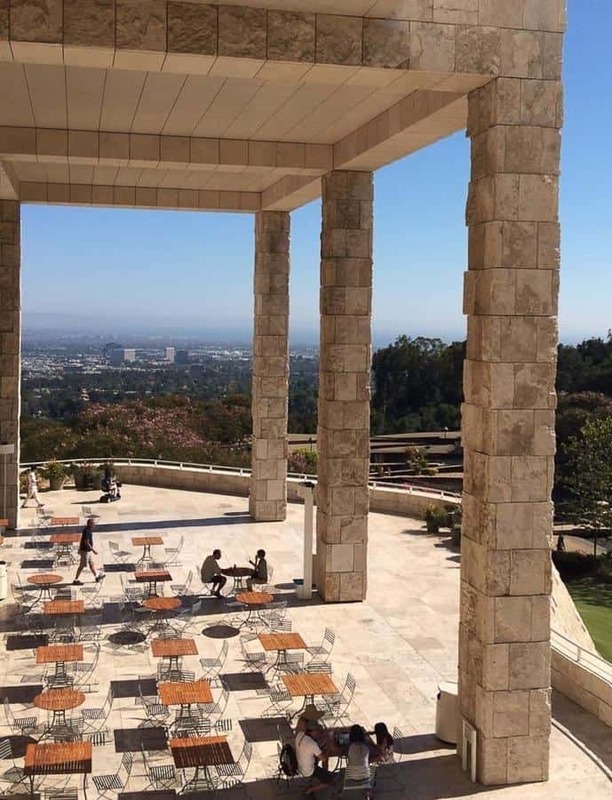 But if you’re looking for something more substantial than the coffee cart, the Getty Center has two on-site cafés and a fine dining restaurant. No Los Angeles itinerary would be complete without a visit to the famous Hollywood. As touristy as this place may be, it should be part of your L.A. list of attractions. Especially if this is your first time in the city! 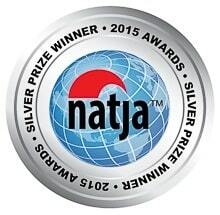 Hollywood enjoys an international reputation like no other place in the world. Although some parts of the area are undeniably derelict, Hollywood still sparkles with glamor. You can start your last 3-day itinerary with a walk on the famous Sunset Strip. The strip is the 1.5 -mile stretch of Sunset Boulevard that passes through West Hollywood. 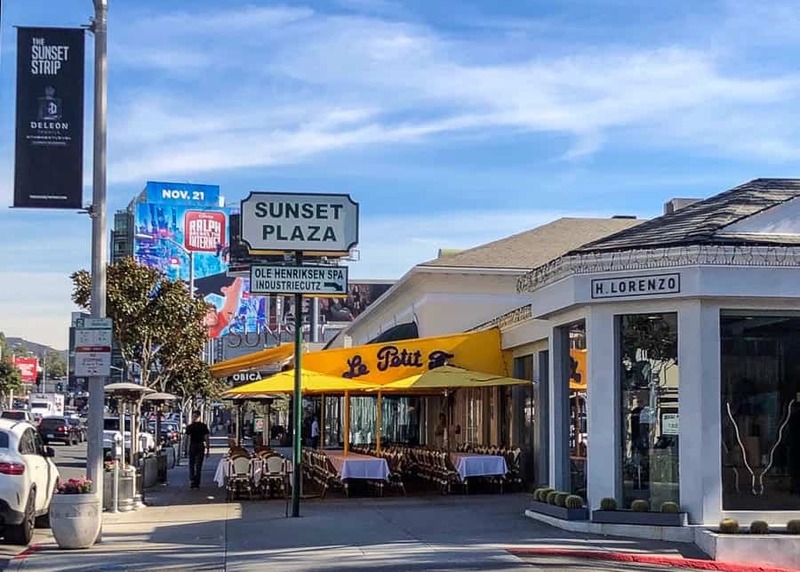 Sunset Boulevard extends from Hollywood all the way to Beverly Hills. Sunset Strip is home to flashy boutiques, high end restaurants and nightclubs, as well as huge, colorful billboards. And it’s not impossible to bump into a celebrity at one of the hotel bars in West Hollywood, or in one of the high-end boutiques on Rodeo Drive, in Beverly Hills. The Chinese Theater became famous for being the venue of the Academy Awards ceremony from 1944-1946. 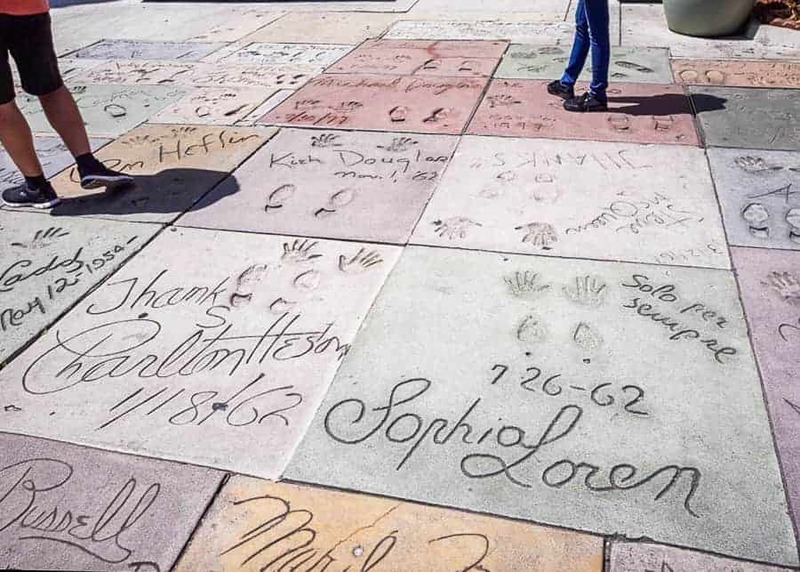 But most visitors are lured here by the celebrity handprints and footprints in the concrete of the theater’s forecourt. The tradition began during the theater construction, when one of the Hollywood legends at the time accidentally stepped into the wet cement outside the building. Instead of covering the imprint, theater owner Sid Grauman encouraged other celebrities to repeat the “mistake.” And so it all began. The courtyard is usually cluttered with tourists trying to snap a shot of the famous imprints. 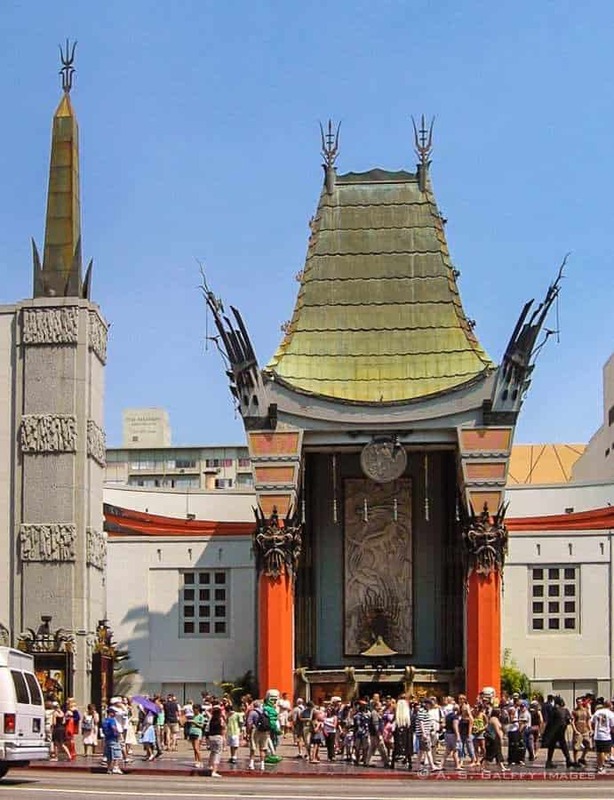 In 2013, after extensive renovations, the The Chinese Theater was turned into a grandiose 923-seater IMAX auditorium that projects stunning quality movies. If interested, you can still watch a movie in this iconic landmark. Right next to the Chinese Theater on Hollywood Boulevard is Dolby Theater – the current and permanent home of the Academy Awards. Dolby Theatre opened its doors in 2001 as the Kodak Theatre. Its façade is at the front of the Hollywood & Highland Center, a nice shopping area with boutiques and souvenir shops. 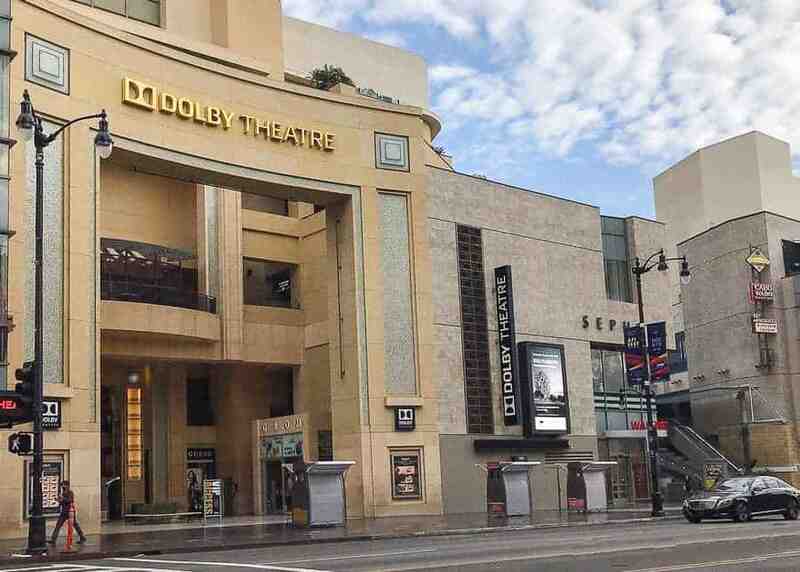 You can take a guided tour of the theater all year round, except for the time leading up to the Academy Awards in February, when the Dolby Theater is off limits. If the Oscars are your thing, you’ll find the tour very interesting. 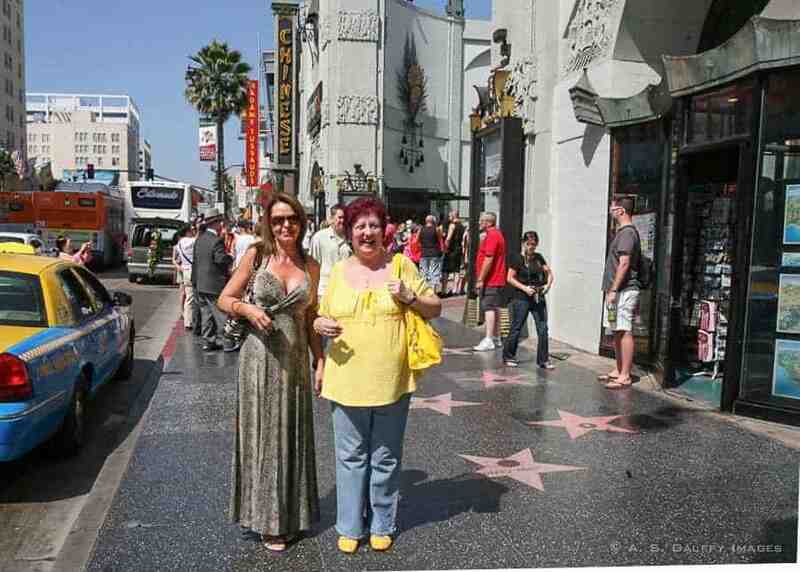 The guide will take you on the red carpet path that the celebrities follow from Hollywood Boulevard into the theatre. You’ll see the VIP Room, the Green Room and then you’ll go out onto the stage. You will also see where the actors seat while they wait to hear if their names will be called. The Walk of Fame is an internationally recognized Hollywood icon. It encompasses over 2,600 five-pointed stars made of terrazzo and brass and embedded in the sidewalks along Hollywood Boulevard. The stars bear the names of famous musicians, actors, directors and producers and are given in recognition to achievements in the entertainment industry. What began as a Chamber of Commerce marketing tactic, is today one of Los Angeles’s biggest magnets. It attracts an estimated 10 million visitors each year. If can read more about the history of the Walk of Fame here. Unfortunately, the Walk’s fame (pun intended) ruins its appeal. It is always crowded with costumed characters offering to take pictures with the visitors, illegal street vendors handing out CDs and tickets, and shady characters. Most people who ever visited the celebrated Walk of Fame will probably tell you it’s not worth your time. And truth be told, walking the entire 15 blocks (1.3 miles) from east to west on Hollywood Boulevard is not something I would recommend. However, if this is your first time in L.A., you should at least take a few steps up and down the street, to see what the buzz is all about. 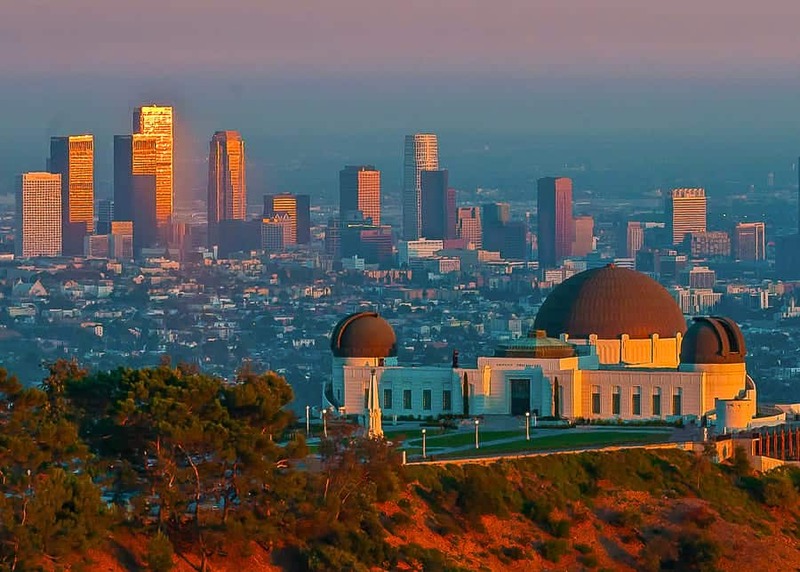 You can end up your Los Angeles itinerary with a sunset visit at the Griffith Observatory. The Observatory features space-related exhibits, star shows in the planetarium, and a telescope. Admission to the Observatory building, grounds, and telescopes is always free. 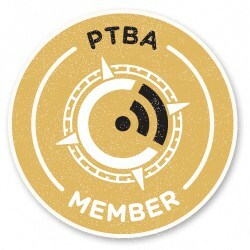 However, you will have to buy tickets for the planetarium show. The grounds of the Observatory are very beautiful, featuring some terraces from where you get a bird-eye view of the entire valley. On a clear day, you can see all the way to Santa Monica from up here. This is the best spot to take a panoramic picture of the downtown Los Angeles. Also from up here, you can catch an unobstructed view of the Hollywood Sign, which is on the opposite hill. 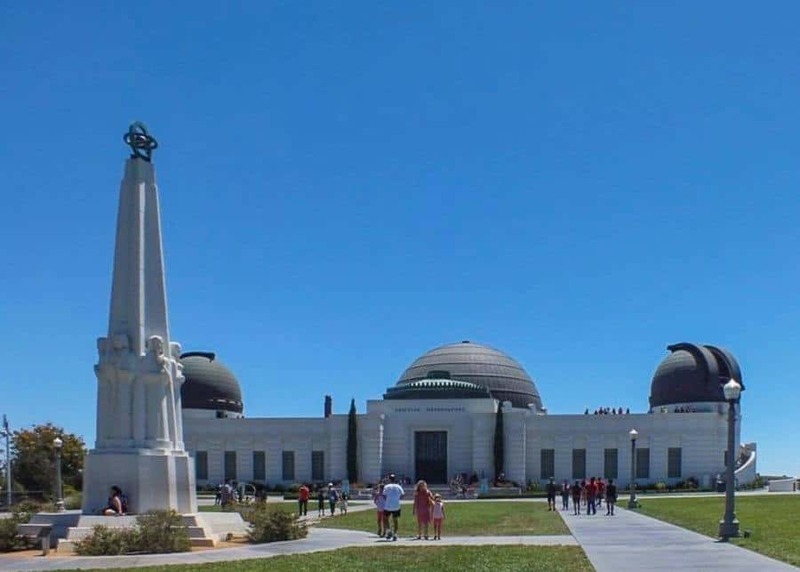 The best time to visit the Observatory is late afternoon towards the evening when you can stick around to see the sunset and city lights.There are several ways to get to Griffith Observatory: via public transportation, shared ride, by bike, or simply by walking from parking elsewhere in the park. There is also parking near the Observatory ($8.00 per hour), but is very limited. 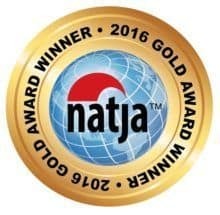 Unless you plan to rent a car and do this entire Los Angeles itinerary on your own, Starline Tours offers a good opportunity for some tours. The double-decker bus essentially operates an entire network circuits across the city, from Downtown to Santa Monica. Buses arrive at most major tourist attractions every 20 to 30 minutes, so you can hop on and off as you want. You can avoid the crowded spots and linger in more the one that interest you. Between attractions, you can listen to an interesting narration through your seat’s headphone. It's been nearly 20 years since my last visit to LA. I'd like to go back and do it properly. I didn't realize that the Hollywood sign isn't lit up at night and spent a lot of time trying to find it unsuccessfully in the dark after attending an awards show. So a return visit is due and I'd definitely like to see the Santa Monica Pier, Venice Beach and finally actually see the Hollywood sign. This is the most comprehensive article introducing LA for first timers. I have not been there but for me, public transport any day. Helps me to do other things than watching for the cars on road :). Except probably for places not well connected, if any. If you can drive, is better. I've been to L.A. a few times, including my senior trip, many moons ago. My step brother actually lives in Santa Monica. I've seen all of these things except the Observatory. If I even went back, I would go there for sure. When I went to Venice Beach, I couldn't believe everything I was seeing. I was just 17 at that time. There was an outside gym then, full of muscle bound people. The crowds in L.A. are quite overwhelming to me though. Thanks for the introduction to the Observatory. The Griffith Observatory is quite interesting to visit and it's famous for its gorgeous views. What a great guide to LA for first-timers. I have only visited Santa Monica, but would love to get to the Getty Center and the hand and foot prints at the Chinese theatre. I've wanted to visit the Griffith Observatory since seeing La La Land! I never done LA before but hope to do it in the near future but for me, I think I would like to check out the beaches more than the touristy stuff. I am more into nature. Can you still hike up to the Hollywood sign? No, you can't tile to the Hollywood sign. It's good my granddaughter works and lives in Santa Monica. It's also good that I have covered Day 2 except for the Griffith Observatory. I have also not gone to the Getty Center. I visited LA almost half a decade ago and it's a pity that I didn't rent a car and drive to Santa Monica Pier, Venice Beach and Malibu. I've always regretted that. I don't think I'd like to drive within the city itself, however, given the traffic and as you said, confusing parking signs! But it's good that there's the metro for that :) I had some friends who were nice enough to take me around back then but they're not there anymore. If I make it back to LA someday, I'd have to find my own way. Definitely making it to the beautiful coast next time! Thanks for sharing your LA itinerary guide. My other family side lives in LA and some in Santa Barbara, and they all telling me how awesome living in there (even there are many challenges as well, cost of living isn't cheap though). Someday I will visit my family in LA and have a trip using your guide! I'm yet to head to the American continent and when I do definitely I'd want to visit LA. I've heard so much about Malibu beach so definitely it would be in my list. The water is so pristine. 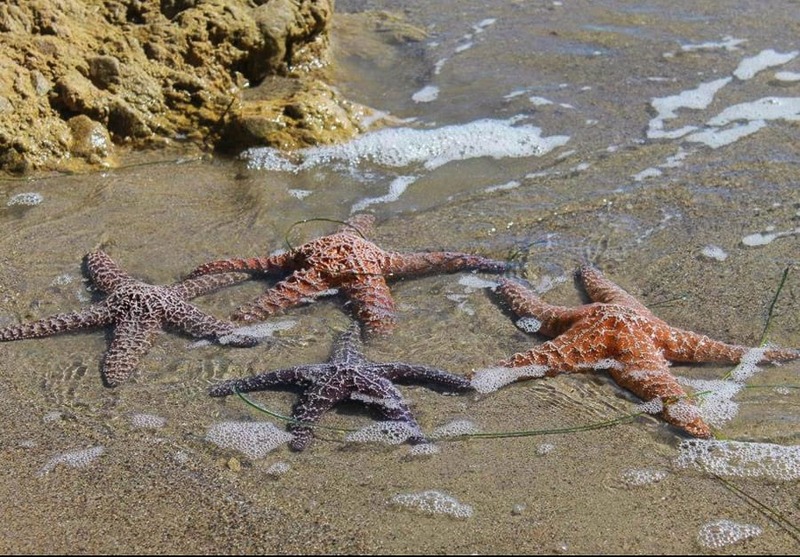 I've not seen star fishes in wild before. I might just spend an entire day in Malibu. Hope you'll make it here someday. I have not been to LA in years and years and I would really love to go back one day. The traffic in LA is however such a put off and whilst I would prefer to have the freedom of my own car, I'm not sure I can handle the traffic. Santa Monica Pier looks like so much fun despite the crazy crowds. I guess that just comes with the territory. Those muscle men still at Venice Beach? I'd love to go to the Getty Center....that is my kind of place. And shopping..... I could go crazy! I agree, the traffic here is a nightmare. This is a perfect 3 day itinerary. In the past I have only spent a day in Los Angeles just passing through and I have really missed out on all the sights. At the top of my list would be the Chinese Theatre and the Hollywood Walk of Fame. A great tip about going to the Observatory late in the afternoon to see the sunsets and the lights below. I have never visited Los Angeles so this is a great itinerary to begin with. Will keep in mind the vastness and not try to squeeze too much. I think the Santa Mobica beach itself will cover half of the day with all the activities. The sunset strip will be on my list for sure. I understand your point about the walk of fame, I will probably just walk around it for some time and then leave. I don't find those places particularly interesting but I dont want to miss out on the most celebrated place in Los Angeles either. Visiting the beach is one of our favorite things to do anytime our destination is nearby. Venice Beach most likely won't shock me with its colorful graffiti, street performers, and funky shops. I've seen it all! I'm also game for a laid back experience at Malibu beach, one of my favorite beaches. Great post! As a local, I definitely think a car is necessary as our public transportation isn't very reliable/safe and the city is just so spread out! The things you mentioned always top the list of our visitors and 3 days is the perfect amount of time to hit them all up. 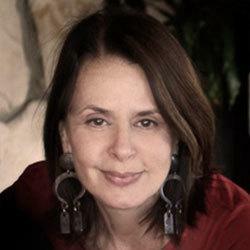 Hello thanks, Anda for sharing such kind of valuable tips and the images you have used its really appreciable. 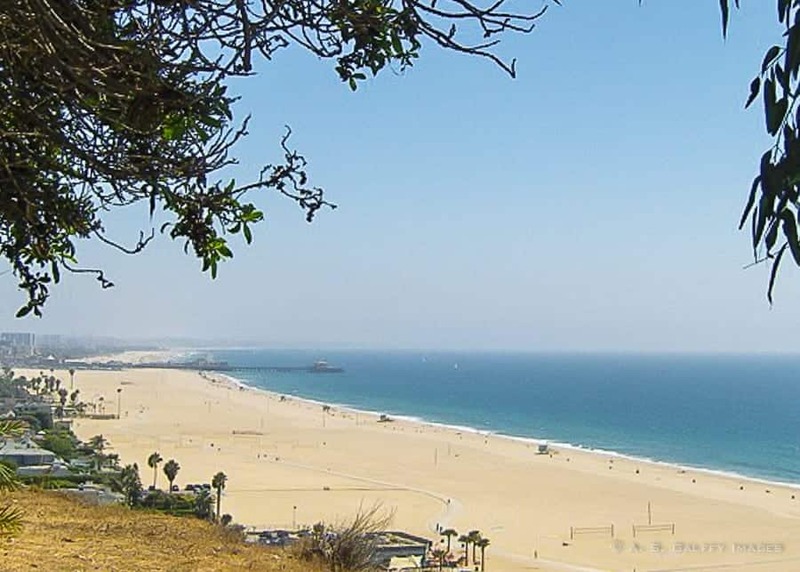 LA is really a home to some of the USA's best beaches and each one has its own unique character. I will definitely travel there!! 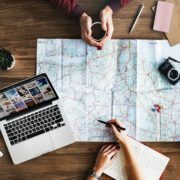 Great tips for a first time visit. I'm passing this along to a friend who will be visiting in May for her first time. Thanks, Jill. Hope your friend will make some use of this information. I have been to L.A. many times yet I have not done it all. 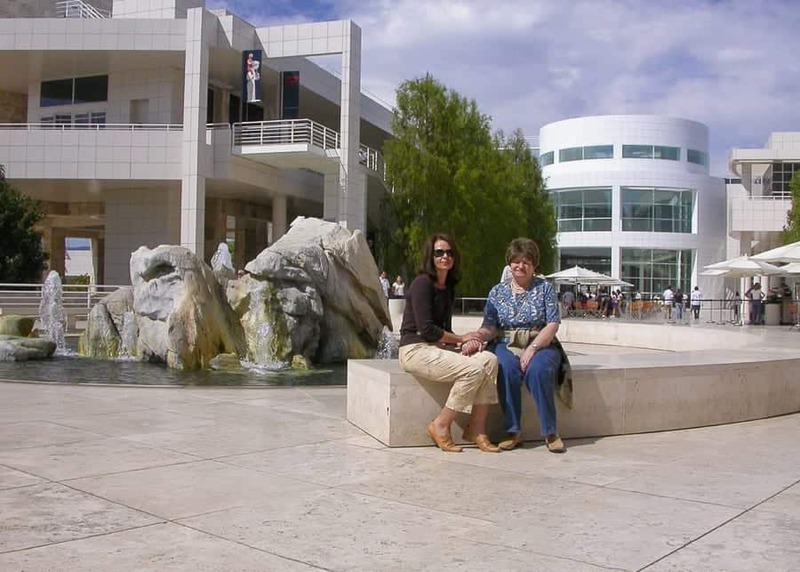 The Getty Center sounds interesting and it is one of the places I have never visited. I also never walked the Sunset Strip. Thanks for some good recommendations. Next time you come here I'll take you on the Sunset Strip, Rhonda. Great post! I just came back from LA myself. Did a two-day getaway and checked out Hollywood, Santa Monica, USC, Chinatown, and the LA City Hall. You are right about there being plenty of shady people in the Walk of Fame area. I'll be writing about my visit there on my blog and how I fell for a scam there - come check it out in a few days!